This first month with Hudson has been WONDERFUL! It's been filled with many firsts-eating out, shopping with Mommy (and Mia and Grandma), meeting Mia, Grandma, and Papa (we can't wait to meet Poppe at Thanksgiving!!! 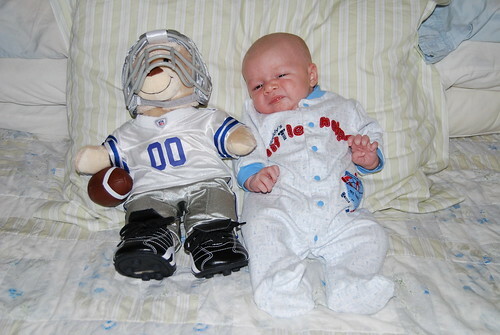 ), going to church, his first bath, and unfortunately, his first cold. I can't believe how quickly the time has gone! 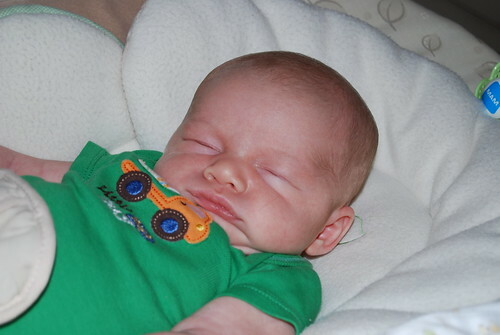 Hudson, you are the perfect addition to our family and such a good baby! At the beginning of week 4 you started eating around 9:45-11 and get up around 3-4 and again at 7-9ish. Wow! I think you might have started doing that even sooner if I hadn't gotten you up every time you made a little noise. 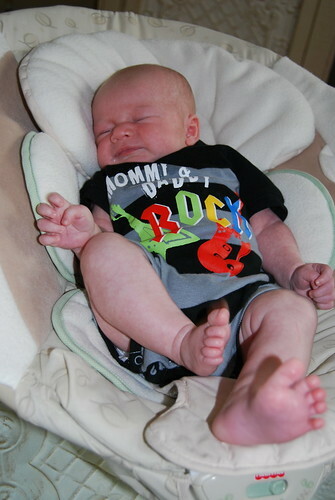 At our 1 month appointment you already weighed 10 lbs. 3 oz. and are the the 75% for your weight and are in the 97% for height. You are growing so quickly, and we are soaking up every minute of you being little because we know it won't last for long! I love you so much and can't wait to watch you grow! 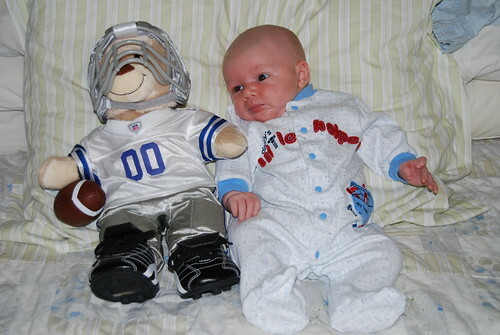 Grandma brought you this Cowboys bear when she came to visit and I plan to take a picture of you with it each month so we can see how big you are getting! Wow! Hudson sounds like such a great baby! Cute pictures! I'm so excited y'all will be home for such a long time very soon! Can't wait to get my hands on that little guy and give him great big loves! And Landree too of course! he is so cute!! and i love the idea of taking the picture with the bear! Cute pictures. He is getting so big! How are you?? Looks like you are keeping busy:) I cannot believe Hudson is already a month old.....he is so cute and has grown so much!! What a sweetie! I can just imagine how good he smells! ha! I'm a sucker for babies...and he's beautiful! Hope you are doing well! Hope your husband had a happy birthday! What a fun party you threw for him. I can't believe it's already been month! Glad everything is going well! Happy belated to Jeff! These are the sweetest pics of Hudson. He is adorable!! I absolutely love that scrunched up little face! I can almost smell that sweet little baby smell....I love that! He is just precious.